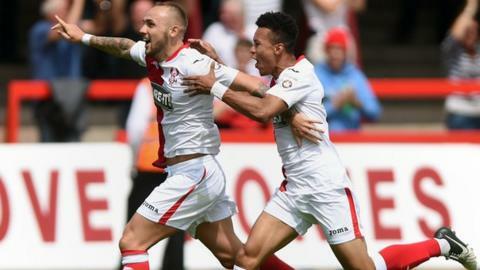 Kidderminster Harriers head coach Dave Hockaday was angered by the way the National League's bottom club were denied their first win of the season. In only his second game since being appointed late on Friday, they led 2-1 going into injury time at Altrincham. And Hockaday raged at the way the home side were 'gifted' their equaliser. "Somebody hasn't got the wherewithal to put their foot through it. We give away a free kick and they score," Hockaday told BBC Hereford & Worcester. "It comes down to moments and a senior pro didn't handle the moment particularly well." Hockaday was also unhappy about the manner of Altrincham's first goal. "It's just gone straight in off a corner. Somebody hasn't done their job. Again," he said. "I'm very angry and frustrated. That definitely feels like a defeat." Who picks the team at Aggborough? Gary Whild was in charge of Harriers for the first eight games this season. When he was moved sideways as head of football operations, the job of head coach was offered to ex-England keeper Tim Flowers but he did not accept it, meaning that for three games nobody was formally in charge. Football development director Colin Gordon then took over for four matches after Flowers and Whild left. Having made six signings since Gary Whild and Tim Flowers left following the 2-0 defeat by Lincoln City on 19 September, the latest two - on-loan Bournemouth midfielder Ben Whitfield and West Bromwich Albion loan striker Joe Ward - both made their debut at Altrincham. "Joe and Ben look to be good technicians," said Hockaday. "They have been groomed at good clubs. They'll give us a little more bravery and technical ability on the ball. "We made a few big calls and left a few out but, but we brought some hungry kids in, and I've got to be proud of the players as it was a massive improvement on Saturday. "There were a few things being thrown in the dressing room after and I like that passion. It hurts and they care. Emotionally and physically, that will have taken a lot out of them. But, if we can improve again, we have an even better chance to get a result on Saturday against Southport. "The fans were brilliant again. They'll have seen more passion from the vast majority of the team, more hunger, more energy expended and people who care for the badge." Meanwhile, Harriers have confirmed that another West Brom youngster, winger Andre Wright, has ended his loan and returned to The Hawthorns.